Blackpool Gazette: Blackpool boss Gary Bowyer says he wants to add to his squad but admits it is ‘not proving possible’ at this time. Wigan Post: Swansea City loanee Jay Fulton has become Wigan Athletic’s third January signing after Jamie Walker and James Vaughan. 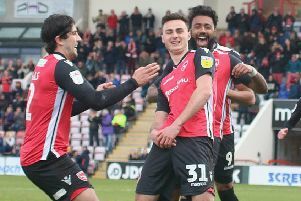 Blackpool Gazette: Fleetwood Town’s January shopping is believed to be over after the loan signing of Preston North End’s Kevin O’Connor - but Godswill Ekpolo has left the club and joined Merida AD for an undisclosed fee. Burnley Express: Jack Cork believes the Clarets have brought in two potential ‘game-changers’ with the arrivals of Aaron Lennon and Georges-Kevin N’Koudou. Blackpool Gazette: Blackpool manager Gary Bowyer admits the potential of losing at least one of his players before next week’s transfer deadline is a ‘concern’. Daily Mail: Spanish striker Sandro Ramirez has told Everton he wants to leave the club.